Milton and surrounding areas, take advantage of an up-close and personal tour, purchasing advice, and pricing structures of the 2016 BMW 5 Series when you visit Budds’ BMW Oakville. The BMW 5 Series has been the epitome of stability and luxurious detail for 42 years and the tradition continues with its graceful luxury, contemporary style, and as always, sporty performance. This Series, featuring the sedan and the Gran Turism, is in a class all of its own with a body style that portrays intellectual appointments, amazing comfort, and extremely attractive appearance perfect for the astute driver. BMW’s 5 Series is the elite of the business class with its aggressive and stylish design. Entering the scene with a class and front moving style that exhilarates and astounds, this class is a perfection of balance. The BMW 5 Series has aggressive engine options, comfortable ride and an exquisitely designed cabin space. Engine power options include the turbocharged four-cylinder and six-cylinder engines, the turbodiesel six-cylinder engine and the twin-turbocharged V8 engine that are all power packed for smooth travel. The base model 528i has an EPA-estimated 23/34 mpg city/highway, while the turbodiesel 535d gets up to 26/38 mpg. This series reigns athletic handling and sharp steering abilities that are fine tuned for a comfortable drive. 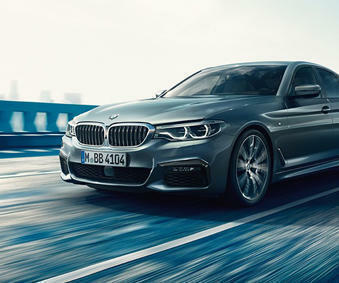 Famous for its long and clean lines presented in the body, the 5 Series defines style, substance and function with its business mode presentation. This series dominates the master concept in design with its signature twin-kidney grille, revision to the lower front air intake area softens the design of the front angle, distinctive taillights, and Xenon adaptive headlights are standard on the 5 Series. Optional LED adaptive headlights illuminate the classic look of this series. The interior design leaves no stone unturned with the luxurious cabin of the 5 Series. Premium Nappa leather gets all the glory with its comfortable appearance and stylish detail. Perfectly balanced with features designed to accommodate the business class and enhance the personal preference, connectivity with an iDrive system features a touchpad controller. Strong curves along the dash and console and spacious seating make the 5 Series a force in its very own right. The 5 Series is the CEO of technical advancements with driving technologies that brings state of the art control to the highway. Adaptive LED headlights illuminates the curves as the Full-Color Head-Up Display allows the driver to focus on what lies ahead. The Land Departure Warning gently vibrates the steering wheel to alert the driver when drifting from the desired lane. If you’re in the market for a vehicle that offers elite performance, style, and innovative technology, the 2016 BMW 5 Series delivers all of this and more. Visit Budds’ BMW Oakville for purchasing advice or to schedule a test drive.